Use exercise bands in place of a pullup bar during your P90X workouts. P90X is a 90-day DVD workout program marketed by BeachBody. The company’s website promises that if you follow this plan, along with the accompanying nutritional program, that you can transform your body. The program includes 12 DVD workouts, some of which focus on strength training while others provide cardiovascular, yoga or stretch workouts. While you can do many of the workouts with just your body weight, some of the exercises require equipment. The chest-and-back workout, for example, requires you to use a pullup bar for two exercises, but you can easily do variations with exercise bands as well. Thread your exercise band through the hoop of a door attachment and move the attachment to the middle of the band. Open a door and put the door attachment at the top of the door. Close the door so that the attachment is secured in place, and lock the door if possible to ensure that no one accidentally opens it. Pull on the band a few times to ensure it is secured. Hold one band handle in each hand and have your palms facing down. Stretch your hands in front of you in line with your head. The band should be taut in this position. If it is not, sit in a chair or position yourself on one knee to stretch the band. Perform a high-band row. This will work your lattisimus dorsi and biceps -- the same muscles targeted by the wide-front pullup. Bend your elbows and pull your hands back until they are at your chest. Pause briefly and slowly extend your arms to return them to the starting position. Perform the high-band row with your arms placed wider than shoulder-width apart as a replacement for the wide-front pullup. Perform the high-band row with your arms close to your sides as a replacement for the closed-grip overhand pullup. Use the same door setup that you used for the pullup exercise. Perform a reverse-grip pulldown in place of the reverse-grip chinup. This will also target your lats and biceps, much like the reverse-grip chinup on a bar. Hold one band handle in each hand, but this time, have your palms facing up. Stretch your hands in front of you in line with your head. The band should be taut in this position. If it is not, sit in a chair or position yourself on one knee to stretch the band. Lean back slightly and bend your elbows back, keeping them close to your sides throughout the movement. Keep your wrists locked so that your forearm and back of your palm are in line. Pause briefly and slowly extend your arms to return them to the starting position. Bands come in different weights or thicknesses. Start with a light band and slowly progress to a heavier band as your muscles become accustomed to this exercise. Check for possible wear and tear on bands before each workout. Do not use bands that have rips or appear damaged, as they may break and lead to injury. Squeeze your shoulder blades together when your arms are pulled back in both exercises to further activate your lats. The P90X program can be quite challenging. Speak to your doctor if you are new to exercising. Also begin slowly, taking longer rests and keeping your intensity low until you are accustomed to the exercises. Keep the movement controlled throughout the exercise. Don’t use momentum to pull the band down. 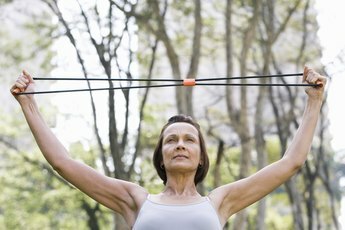 Stop exercising immediately if you feel sudden or sharp pain. Begin every workout out with a warm-up that is at least five minutes long to prepare your muscles, joints, ligaments and circulatory system for the exercises. End each workout with a cooldown of at least five minutes to return your body to resting rate. The warm-up and cooldown can consist of light resistance training and/or a light jog or walk. Follow the cooldown with a full stretch of all your major muscles to increase flexibility and reduce the risk of future injury. American Council on Exercise: P90X, Insanity, Rushfit -- Are These Workouts for Everybody?